October is almost over, but there are still plenty of Oktoberfest events going on around the city. Here are a few places where you can still down some lovely amber lager and a few wursts before winter settles in. On Sunday, October 25, Six Point Craft Ales will be having a party to launch its new Oktoberfest lager - this is just the third lager the brewery has ever produced. The celebration will be from 2pm to 6pm at Sycamore in Ditmas Park, Brooklyn - for $15 you can get a monstrous 3-pint stein, and the first 75 people will get a complimentary plate of bratwurst, sauerkraut and potatoes. Killmeyer's of Staten Island will be serving up a double dose of its house Oom-Pah band, the Happy Tones (pictured above, with Cindy filling in on the tambourine), for Oktoberfest. Through October 31, you can check them out - as well as the gorgeous interiors of this historic German beer hall - on Saturday and Sunday afternoons. They're located at 4254 Arthur Kill Road, Staten Island. 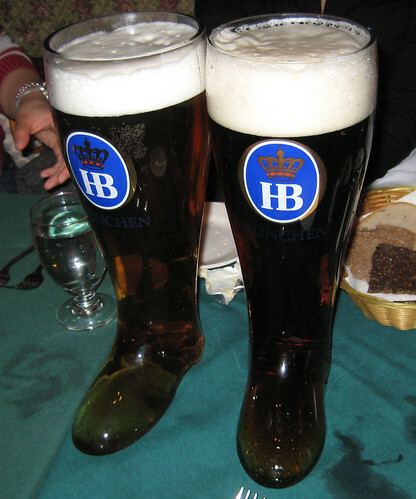 If you want to prove your Oktoberfest bona fides, try downing the 2-liter boot of beer at the Heidelberg Restaurant in the former Germantown neighborhood of Yorkville on the Upper East Side. You can also go next store to Schaller and Weber for a wide selection of German groceries to prepare your own Oktoberfest celebration at home. Oktoberfest isn't just a German institution; most of the beer-drinking of cultures of Central and Eastern Europe celebrate the autumn harvest with a few pints. For a staggering selection of beers and a decent menu, check out the Hungarian-themed Draft Barn in Gowanus, Brooklyn. Out on Long Island, the Schuhplattler Vergnuegungs Verein Original Enzian, a Bavarian cultural club founded in 1922, will be hosting its 87th annual Bauernball, a festival of beer, music and dancing. The event will be on Saturday, Nov. 7 at 7pm at 1132 Hempstead Turnpike, Franklin Square, Long Island. Tickets are $40-$42, and they recommend booking in advance by calling 516-482-6417 or 718-591-6972. After all of this, if you are still feeling starved for German culture, check out the website of Germany in NYC, which provides listings of German cultural events going on around town. And don't forget that you can celebrate German culture, Brooklyn history, and beer every weekend on the Brewed in Brooklyn tour. We will be running tours through December (there are plenty of places to stop and warm up along the walking tour route, even when we get into the winter months), so book your tickets in advance. You will also get a chance to sample the Brooklyn Brewery's own Oktoberfest offering, as well as many other beers, on the tour.